A Monarch Butterfly nearly ready to emerge from its chrysalis in a Scouter’s garden. Learn more about NCAC’s conservation project to help butterflies thrive on page 16. Circulation The Scouter Digest is a tabloid format newspaper published four times a year and mailed to more than 22,000 registered adult volunteer Scouting leaders in and around the metropolitan Washington, D.C. area. On the Cover Pack 873, chartered to Canterbury Woods Civic Association, is one of NCAC’s early adopters of Family Scouting. Den 13, the Llegit Llamas, will represent Scouting as flag bearers at a Washington Nationals game this summer. 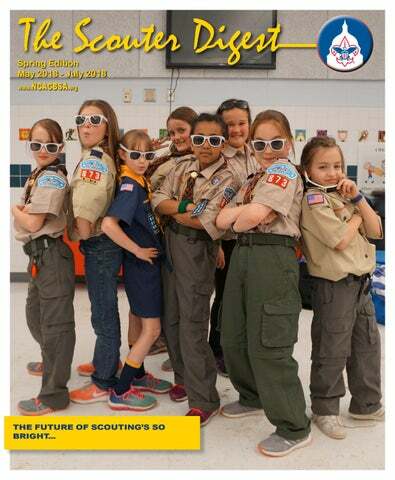 Supported by Friends of Scouting, The Scouter Digest advertisers, and the Combined Federal Campaign. •	Agree to abide by the rules of the pilot program, including a minimum of 4 girls in a Den. (For this soft launch Packs could create an “All Ages Den” with at least 4 girls). Early Adopter Program still provides a good idea of what needs to be done to “Be Prepared!” for the full Family Scouting roll-out. Similar to the introduction of Lions a few years back, this “soft rollout” framework was sensitive to the needs of all families while providing a comfortable starting point for those Packs who are ready to embrace the updated program. And like the Lions rollout, the Family Scouting Program will continue to develop and evolve as feedback is received and new challenges are identified. encouraged to reach out to NCAC directly at family@ncacbsa.org or contact your District Executive. Two Webelos from Pack 873 take part in a service project. New Cub Scout Adventures each week! Activities include: Crafts, Scout Skills, Nature, Shooting Sports, and Games! Scouters who have earned BSA’s national Hornaday Award. There will be information and historical displays about the Hornaday Award, plus other information about Scouting’s environmental and conservation programs. There will be a limit of 750 hike spaces and only 750 special awards will be available. There will be no limit to the number of Livingstone medals available. The ribbon cutting ceremony will be at 9 AM. You can sign up for the 10 AM, 10:30 AM, 11 AM, 11:30 AM or noon Saturday departures, limited to 150 spaces per slot. The cost is $10 plus a suggested donation to the Uniform and Equipment bank. One donated Scout uniform or equipment item per hiker if possible. Donated items may include: Scout shirt (any era, any size, Boy Scout or Girl Scout), Scout pants, sashes, hats, backpacks, sleeping bags, etc. Each paid hiker will receive 2 patches – one hike patch and one Council HOST shoulder patch, plus the materials, answer cards and information included in their packet. The hike challenges will not be given out until the day of the hike! It will start at the Omni Shoreham Hotel and end near the Smithsonian Castle. You do NOT have to be a registered Scout to go – parents, siblings and friends are all welcome. The hike is about 6.5 miles and will take from 4 to 7 hours. Sign up is on-line only! REGISTER NOW at bit.ly/hornadayhike. To celebrate another banner year for NCAC popcorn sales, more than 900 Scouters gathered at Camp William B. Snyder for the annual Popcorn Sellers Celebration. Scouts who sold over $1,000 in Trail’s End Popcorn during the 2017 sales season and their families were invited to enjoy rides, engage in STEM activities, shoot BB’s, practice archery, play games, and more at the March 24th party. candy. Needless to say, this was also, by far, the most active line of the day. Congratulations to all of our Top Sellers who “earned their own way” and contributed to the success of their Units and the Council. Photos courtesy of Robert Snip. People Who Move America On Wednesday, May 16, 2018 NCAC will present People Who Move America Good Scout Awards to Congressman Jeff Sessions, Chairman, Committee on Rules, House of Representatives, Mr. Scott Ernest, President & CEO Textron Aviation, Ricky Smith, CEO BWI Thurgood Marshall Airport, and Kevin Burke, President & CEO Airports Council International. Come join us as we honor our distinguished recipients at the Renaissance Washington, DC Downtown Hotel in Washington, D.C. as we pay tribute and recognize these four gentlemen for their efforts in moving America forward in the transportation industry. Presenting the awards will be co-chairs Pete Pantuso, President and CEO of the American Bus Association and Randy Babbitt, former Senior Vice- President of Southwest Airlines. This special event raises over $100,000 to support the programs of the National Capital Area Council. To learn more about this event and how you can participate, contact Jenna Welle at 301-2149151 or Jenna.Welle@scouting.org. The 38th Annual Boy Scout Golf Classic Time to tee up for the 38th Annual Golf Classic to be held June 11, 2018 at the Manor Country Club in Rockville Maryland. The tournament raises more than $200,000 annually to support the programs of our council. Last year was a record year for the tournament in both participation and this year we are on track to surpass our goal and our event is full with 60 foursomes. We are grateful to all who participated and contributed to our success. Each year we are honored to have GEICO, Value Momentum, Safelight, Enterprise, Dynatrace, and Horizon Media as our corporate sponsors. Washington Global Law Group, PLLC Jack H. Olender & Associates Vedder Price, P.C. Seating for two at event, name/company listed in the program. Seating for one at event/company listed in the program. $_____________ contribution to ensure local young people can continue to experience the quality programs of National Capital Area Council, Boy Scouts of America.  $2,500 – Full-page ad in the event program.  $1,000 – Half-page ad in the event program.  $500 – Quarter-page ad in the event program. NOTE: A portion of your gift is tax deductible per IRS regulations. their loyalty and continued support. Of Counsel Fay Law Group, P.A. Fred Thomas Dale W. Walter Dale W. Walter Larry Houghtaling Ryan Hall Larry Houghtaling Henry Duncan, Jr.
Henry Duncan Michael Bensen Michael Bensen Henry D. Duncan Jr.
Christer Lucander Senior Vice President City First Bank of D.C.
Register online at www.ncacbsa.org/courtofhonor and join us to honor the 2018 class! Camp Snyder is gearing up for a summer of adventure in the Wild West! Our Cub and Webelos guests will have a fantastic time with BB’s, archery, swimming, boating, field games and more. We will work on bits and pieces of many different, rank specific, adventures as well as completing the Cub Scouts shooting sports requirements. Come check out all the awesome programs Camp Snyder has to offer by visiting our website at www.gotosnyder.org as well as finding us on Facebook. Camp Snyder offers four Cub Scout family camping opportunities per year. We offer our spring Bulls Eye and Bulls Eye II camping and shooting sports events in April and May. We offer a STEM specific day and family camping event in September. We offer a Cub Scout EXPO event every October. We also offer a Webelos and Boy Scout event in November. Each of these events offers the opportunity for Packs or individual families to come out and play for the day and camp for a night. We offer an optional meal plan to those who want to opt in. Let us take the work and stress out of your Pack spring and fall campouts. Have You Ever Heard of a Campmaster? Do you love Camp Snyder? Do you want to support the year round operations of the camp? You might be a good fit as a Campmaster? What is a Campmaster? A Campmaster is an adult Scouter who uses his/her experience, training, and knowledge of the Scouting program to help both Scouts and their adult leaders develop skills in the outdoors. Our Campmasters make our weekend camping opportunities possible. A Campmaster agrees to be responsible for the checking in and checking out of units for the weekends they volunteer to work as well as helping make our guests stay more enjoyable while at Camp. with insulated walls, lumber and materials storage, and a large collection of power woodworking tools. Camp Snyder volunteer service days and maintenance raids have their own special place and mission, because they are for anybody who cares about Camp Snyder. You don’t need carpentry skills, you don’t need your own tools, and you don’t need to sign up for yet another group. Just show up at a time that works for you, and we’ll put you to work at a task you can do for however long you can stay – which may be all day or may just be a half hour. Have a donut, enjoy the great company and fun conversation, and have the satisfaction of seeing the results of your work. For more information contactDan Kurtenbach, danielkurtenbach@hotmail.com. Premier outdoor programs 2018 Registration Now Open! and your own food and we’ll provide the fun. Registration is open. Visit www.gotogoshen.org/family-camp to learn more and register. Do you like camping and the outdoors? Did you have a great time at camp? Why not go there for the whole summer? Be part of an awesome group of people and work at one of the coolest summer jobs you could ever have! Staff must be 15 years or older to be an instructor and 16 years or older to work at Lenhok’sin High Adventure. Not yet 15? If you’re 14, you can be a Counselor-inTraining at any of our resident camps! We’re also always on the lookout for those 18 years of age or older to take on leadership positions. Apply online and get more information on our website at www.gotogoshen.org/staff. Bowman Vets: Goshen’s Older Scout Program X-Pride program and the Marriott Adventure Program into one Reservation-wide Older Scout Program. which gives the participants the opportunity to experience a little bit of the adventure activities available at Goshen’s High Adventure camp. Options include shooting blackpowder rifles and climbing on natural rock faces, among others. For more info visit www.gotogoshen.org. Already registered for Goshen this summer? Sign up where you sign up for Merit Badges. Above: Sharnise-Hawkins Graham, Exploring Advisor Post 1937, receives Law Enforcement Officer of the Year award from Greenbelt Mayor Emmett Jordan. Officer Sharnise Hawkins Graham’s five years of policing accomplishments included responding to citizens’ needs, collaborating on training and maintaining perseverance in her daily police work. At right: The salute at the wreaths is offered in memory of the men from Greenbelt who were killed in action (KIA). 15 were KIA in World War 2 and 3 were KIA in the Vietnam War. Ever wondered what it takes to be a Skipper or other adult leader in Sea Scouts? Have you said “I don’t have the foggiest idea how to sail?” So did most of our Sea Scout leaders. But many said “I’ll join Sea Scouts – they’ll teach me.” And they were right! Saturday morning the gear gets stowed because a neat cabin is a safe cabin. Duty rotations are assigned, the coordinates on the charts are published, courses are set and the docklines released. SSTV der PeLiKan rounds White Rocks and is off into the Chesapeake. Each year, the senior leaders in the Sea Scouts take groups of new adult leaders out aboard the SSTV der PeLiKan – a 46ft Morgan Ketch. (A Ketch is a sailboat with two masts, with the taller mast in the front.) For two days and two nights, they learn everything needed to run a basic Sea Scout program. From there, students must maintain watch on the foredeck to ensure they don’t run over a loose crab pot left in a channel by a reckless crabber. Others will pull the pencil and protractor and ensure that when you can’t see land, you are still headed in the right direction. With a little luck and a bit of wind, they’ll release the sails, heel to starboard and let the wind be their engine. They learn to take in the sails, release the sheets and avoid the shallows. Saturday ends with dropping anchor off a secluded island in the Chesapeake. Anchor watch is set, dinner is prepared, and the crew finishes their day under a darkened sky with only the waves to keep the boat company. On Sunday they practice docking exercises – which can be particularly fun with 15 tons of boat and no brakes. But everyone takes a turn. It ends with pulling the majestic flagship back into her slip, a thorough cleaning and the knowledge that it’s not as complicated as everyone things. What do they learn? Anyone can sail. And Sea Scouts will teach you how. Above: 2017 Public Safety Award recipients representing the Greenbelt police, Maryland State police, U.S Park police Greenbelt and Berwyn Heights first responders and Greenbelt public works. Please join us in celebrating the years of dedication and service performed by the 2018 Captain John B. Montgomery Class of Silver Beavers. Christopher Cooper Walter (Jay) Eidson Jr.
out Brian Sun and Vladislav Kovalskiy from Beltsville Troop 1033 and Kaden Locke and John Hollen from Chesapeake Beach Troop 429, Western Shores District in the closest competition of the day. Also on hand for the event were United States Fish and Wildlife Services Midwest Regional Director and head of monarch conservation Tom Melius and National Wildlife Federation CEO and President Collin O’Mara. Both delivered words of encouragement to the assembled crowd and pledged to stand with Scouts in their efforts. Vienna Troop 1143 was third ahead of 111’s Ian Murray and Drew Gorman and Jimmy Waddick and Owen Nemirow. Two outstanding top five NCAC results in the older category were from the teams of Ryan Ermovich, Ben Gordon, and Alex Sheehey from Arlington Troop 647 and Milo, Matthew, and Maximilien Engle from Venture Crew 1130 in McLean. “We hope this lights a fire that inspires conservation in young people across America,” said O’Mara before thanking Scouts for their work. The programs is already receiving national attention with chatter increasing on social media amongst conservation groups from as far away as British Columbia. The project was also featured on the Bryan on Scouting page, Scouting Magazine’s popular online blog for BSA’s adult leaders. Scouts in the region have been given packs of milkweed seeds in exchange for a pledge to plant them, allow wildlife to thrive within these milkweed gardens, educate their community about what they see and learn, and have fun in the process. Scouts are also encouraged to wear commemorative patches that display their commitment toward monarch preservation and help raise awareness for the effort. To learn more about Milkweed for Monarchs, please visit www.ncacbsa.org/monarchs. instructional tips, and patches. First Aid and search and rescue support was provided by Calvert, Howard, and College Park Civil Air Patrol units. Troops wanting more orienteering were steered toward public events with beginner instruction and courses at Great Falls, Cabin John, Seneca Creek, Lake Needwood, Little Bennett, Wheaton, Greenbelt, Rosaryville, Prince William Forest Park, Mason Neck, Manassas, Fountainhead, and Balls Bluff (Leesburg) parks, all listed at http://qocweb.org. In 2018 the 42nd Annual MD Scout Orienteering Day will be at Patuxent River Park near Upper Marlboro on October 27 (Oct. 26-28 if you decide to camp.) You’ll find more details on this event in 2018 and full results from 2017 at www.BaltimoreBSA.org/orienteering (or email DaveLinthicum@earthlink.net.) NCAC’s highly popular and well-run annual Scout orienteering day with instruction for beginners is March 24, 2018 at Prince William Forest Park in VA; contact Jim Chaplin at jhchaplin@ comcast.net. Old Dominion District Advancement Chair and NCAC STEM Committee Representative, Mr. John Selstrom, presented several Supernova Awards this spring! Pack 1147 Cub Scouts Denver F. and Kiernan M. show their newly earned Dr. Alvarez Supernova certificates and medals. Also pictured: John Selstrom and Katrina Best, the youth’s Supernova Mentor. John Selstrom presents the Dr. Luis W. Alvarez Supernova Award to Oliver Best of Pack 1147. “Tyger Tyger, burning bright, In the forests of the night; What immortal hand or eye, Could frame thy fearful symmetry?” ...so begins the poem “The Tyger” by William Blake. Are your Cub Scouts scared of math? Are they fearful when you suggest earning a Nova in the Math discipline? There is no reason to be afraid. “Fearful Symmetry”, the newest Cub Scout Nova Award, will let them explore the mathematical world of symmetry, mirrors and patterns. Explore the wonders of archaeology! Learn about artifacts, ecofacts, biofacts, and petroglyphs by way of hands-on activities. One of the optional activities encourages Cub Scouts to explore a trash can (with parental permission and gloves) – to differentiate between artifacts and ecofacts, and to guess how old the layers of trash are! Another optional experiment involves preserving a hot dog with baking soda. Scouts are cautioned not to eat the hot dog from the experiment! Pack 991 Webelos Garrett K., pictured with John Selstrom, earned the Dr. Charles H. Townes Supernova Award. Boy Scout Nova Awards Shoot! Start your Engines! Whoosh! Designed to Crunch Let it Grow! Training Over the decades, the Boy Scouts of America has been a leader in developing training and policies designed to keep young people safe. These comprehensive policies were considered groundbreaking when they were developed and soon became the standard used by other organizations for safeguarding youth. But when it comes to the safety of children, our goal is to continually improve. •	As of September 1, 2017, no unit may re-charter without all leaders being current on their youth protection training. Registrars no longer have the ability to approve charters without full compliance. 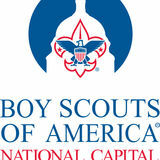 •	The BSA also provides unlimited counseling and support for healing to anyone who has ever been abused in Scouting. By October 1, 2018, all new and currently registered leaders will be required to complete the updated training. The enhanced and updated content will allow leaders and councils to comply with all current legal requirements. While this may be inconvenient for some, it reflects the BSA’s commitment to the safety of all youth. For camps this summer across the BSA, adults accompanying units on activities who are present at the activity for 72 hours or more, must be registered and take Youth Protection Training. The 72 hours need not be consecutive. If your unit desires to set a stricter policy (e.g. ALL adults going to camp must be registered and have current YPT), that is certainly permitted. National Youth Leadership Training (NYLT) equips young people with leadership skills to help them succeed in their Scouting program and in life. NYLT brings together Scouts from all over the council to learn and practice leadership techniques in a risk free, Scout-friendly environment. The Scouts learn and practice leadership skills and styles together. NYLT is for Scouts who are likely to take on leadership positions in their Troop, Crew, Ship or home unit. NYLT is an intense course for mature Scouts who want to become better leaders. Scouts must be respectful of each other and their actions must be consistent with the Scout Oath and Law. •	As of January 1, 2018, no new leader can be registered without first completing youth protection training. •	As of January 1, 2018, no council, regional or national leader will be allowed to renew their registration if they are not current on their youth protection training. •	In-person youth protection training available June 2018. •	Training stations at the Marriott Scout Service Center. No person can become a registered leader in Scouting without Volunteer Screening Database Check Education Empowerment first completing the BSA’s youth protection training. All registered Before an applicant can join or volunteer with adult volunteers are required to complete the training. No BSA required to complete Scouting, personal safety awareness training the BSA verifies that he orwith she parents is not •unit Parents youth are required may beand re-chartered unless all registeredScouts leadersare have and leaders as a requirement for rank advancement. The BSA teaches “three included in our database of individualsthe that haveR’s” to reviewthe theBSA’s BSA’syouth Youthprotection training. The training is completed of youth protection, which convey an important message in a clear manner easily been prohibited from participation. The database Protection materials, available online 24 hoursavailable a day, seven days a week. understood by youth members: prevents individuals from re-registering in Scouting at the front of every handbook, who were removed for a range of misconduct as a condition of enrollment. and inappropriate behavior inside oroperate, outside the • Recognize situations that place them at risk, how child molesters • Every application for youth Chartered Organizations Reference Check organization, including allegations of abuse. and that anyone could be a molester. membership advises parents about the basic principles of local insight •andRespond Chartered organizations provide ongoingto suspected, attempted, or actual abuse, as well as policy violations that may prevent the full use of the barriers to abuse. If a peer is affected, youth protection. supervision. The involvement of local chartered organizations reassure them that they are not to blame and encourage them to seek help. •(churches, Every parent completing schools, or civic groups) helps ensure that volunteers • Report suspected, attempted, or actual abuse to a parent, trusted adult or law youth membership areaknown and trusted inform the community. enforcement. This prevents further abuse and helps protect other children. acknowledges awareness of the Understand that you will not be blamed for what occurred. BSA’s Youth Protection policies. We constantly evaluate and invest resources to strengthen our policies and ensure they are in line with, and where possible, ahead of best practices for prevention. To support this ongoing effort we regularly consult with survivors and experts from law Support enforcement, child safety, psychology, and other relevant fields. The Boy Scouts of America is outraged there have been times when individuals used our programs to gain access to and harm The BSA has a multi-tiered youth and protection approach focused on volunteer screening, andyouth training children, and established for that we apologize to victims their families. Nothing is more important than theeducation, safety of our members. for everyone in the program, and clear policies to protect youth, including prohibiting one-on-one contact between andheal on We are committed to providing ongoing support to victims and their families, including counseling. We want to helpadults victims youth members. All units, adult leaders, and youth members have a responsibility to adhere to and enforce youth protection their own terms. Support is available to anyone currently or previously involved in the Boy Scouts of America through our dedicated program policies. 24/7 Scouts First Helpline 1-844-SCOUTS1 (1-844-726-8871) or at scouts1st@scouting.org. youth members. All units, adult leaders, and youth members have a responsibility to adhere to and enforce youth protection program policies. • Parents and youth are required to review the BSA’s Youth Protection materials, available at the front of every handbook, as a condition of enrollment. • Every application for youth membership advises parents about the basic principles of youth protection. • Every parent completing a youth membership form acknowledges awareness of the BSA’s Youth Protection policies. Scouts are required to complete personal safety awareness training with parents and leaders as a requirement for rank advancement. The BSA teaches the “three R’s” of youth protection, which convey an important message in a clear manner easily understood by youth members: • Recognize situations that place them at risk, how child molesters operate, and that anyone could be a molester. • Respond to suspected, attempted, or actual abuse, as well as policy violations that may prevent the full use of the barriers to abuse. If a peer is affected, reassure them that they are not to blame and encourage them to seek help. • Report suspected, attempted, or actual abuse to a parent, trusted adult or law enforcement. This prevents further abuse and helps protect other children. Understand that you will not be blamed for what occurred. Support The Boy Scouts of America is outraged there have been times when individuals used our programs to gain access to and harm children, and for that we apologize to victims and their families. Nothing is more important than the safety of our youth members. We are committed to providing ongoing support to victims and their families, including counseling. We want to help victims heal on their own terms. Support is available to anyone currently or previously involved in the Boy Scouts of America through our dedicated 24/7 Scouts First Helpline 1-844-SCOUTS1 (1-844-726-8871) or at scouts1st@scouting.org. Eagle Scout, Sea Scout, Venturing Awards The National Court of Honor has awarded these ranks to the following young men and women whose certificates have been returned to our office between December 19th, 2017 and March 17th, 2018. Join us for some social time and networking! Planning ahead? Register now for these upcoming NESA DC networking events at http://bit.ly/nesadc. 9/13 – Eagle Lunch, Tysons’ Seasons 52, 11:30-1:00, Host: Craig Davis 9/27 – Eagle Happy Hour, Bethesda’s Caddies, 5:30-7:30, Host: Alan Belanger The VA South area recently held an NESA DC Eagles in the ‘Burg gathering. Eagle Scout Alumni from the surrounding area including Aquia and Mattaponi Districts had some valuable social and networking time at Adventure Brewing South. Many stories and experiences were shared of times long ago as youth backpacking and performing Order of the Arrow ceremonies. The entire group really appreciated the time together and are looking forward to the next Eagles in the ‘Burg gathering. We hope to see more of you down the Eagle Alumni trail. Commissioner’s Corner Commissioner College Celebrates 75 Years of Commissioner Training On March 10, 2018 at the Kensington LDS Church, one hundred and fifty two (152) commissioners gathered together for a full day of fellowship, training, inspiration, and recognition at National Capital Area Council’s College of Commissioner Science. Dean Julia Mae-Shen Farr selected the theme of “Celebrating 75 Years of Commissioner Training”, and recruited National Commissioner Service Training Chair Tim Acree to provide a keynote address in which Tim described the rich history of commissioner training, leading to the recent revamp of the online modules and the college curriculum. Mike Nepi Receives Mack Award with his Lovely Wife Dale during his talk. Charter Renewal – A Success Story One of the five major objectives for commissioner service is timely unit, district and council charter renewals. posted for the new Scouting year. Some units renew their charters throughout the year, but for most task is done, and they are ready for Spring. In addition to training and inspirational talks, we took time to recognize several outstanding commissioners.Congratulations to Mike Nepi on receiving the John A. Mack Council Commissioner Award of Excellence (with his lovely wife Dale). Congratulations to recipients of the Robert L. Dise Dean’s Awards: Randy Wilson, Peter DeSalva, and Jess W Speaker III. Congratulations to the recipients of the Doctorate of Commissioner Science (DCS) Knot Award presented by DCS Dean Robert Owen: Bill Desmond, Mark Longworth, Julia Mae-Shen Farr. Council ranked #1 in Northeast Region’s Area 6 in unit retention at 95.1% - a national leader. What that means is that unit leaders are delivering a program meaningful enough to our youth that they are staying and sustaining strong units. Our membership teams and Commissioners are documenting who is continuing the Scouting trail through the renewal process. The result is that we continue to offer a safe, fun, and challenging program to develop youth into tomorrow’s citizen leaders. National Capital Area Council (NCAC), Boy Scouts of America (BSA) elected two new executive committee members and five new board members at its annual meeting last night. These new members will serve the Council for the next year just as the council is welcoming girls into Cub Scouting and expanding its Family Scouting offerings. offering tremendous value as role models for our young people and helping achieve our vision to ensure youth are prepared for anything life sends their way.” Under the guidance of the Executive Board, Baron provides leadership to the Council, which serves more than 58,000 youth through the dedication of more than 20,000 registered adult volunteers across 17 counties in Maryland, Virginia, Washington, D.C., the U.S. Virgin Islands, and Scouts living abroad in North and South America. It is not too early to launch our program for 2018 and 2019. We have already started to work all aspects of the Scouting program for the coming school year and beyond. The Program Launch event, traditionally held in the spring, is an opportunity for leaders, parents, friends and others of our community to learn about Scouting and about our Potomac District which is an important part of the National Capital Area Council of the Boy Scouts of America. There are nearly 160 scouting units, including Cub Scout Packs, Boy Scout Troops, Venture Crews, Explorer Posts and others, registered in our Montgomery Area -- total of nearly 8,000 youth and more than 3000 adults. The professional staff of the National Capital Area Council provides support and program resources throughout the year and in many ways. served by a district chairman, local volunteer leaders, professional district executives and others. The combined program inaugurated this year recognizes that education, public safety, health and welfare services and other programs that contribute to Scouting are provided by our county as a whole and that our citizens comprise a strong community of more than one million. We encourage all exhibitors, including Scout leaders, commercial firms, government agencies, non¬governmental organizations and all others interested to join us at this event. It is being held right here in our area and is organized to be brief but instructive -- and great fun on that evening. Our Program Launch will be held in the fellowship hall of the Faith United Methodist Church, 6810 Montrose Road, Rockville, Maryland. The doors will open for exhibitors at 5:30 p.m. on May 10. We will be packing up after 9:00 p.m.
(Above) New Eagle Scouts at the March Eagle Board of Review. (Left) Venturers planning activities for Venturing’s 20th anniversary. Seneca District Those Who Serve: Wreaths Across America by: Chris Collins, DCA Vice President, US Army – Ret. as a few old veterans standing in the audience of approximately two hundred people from inside and outside of the community. So, who are the “tradition makers” who spearheaded this idea? None other than Bill and Sue Gooch, actively supported by the members of their motorcycle club, The Independent Civilians. As the name applies, the club’s selfless actions focuses on community service with a particular focus on supporting our military personnel, past and present. With their vision, dedication, and hard work, we as a community have been further enriched. I should also mention that the Wreaths Across America ceremony would not have been successful without the overwhelming generosity of our citizens who contributed by financially sponsoring the program through the purchase of wreaths. And there we have it - A cohesive gathering of the young, the old, and the veterans’ community, thus establishing a new and honored Darnestown tradition! Sunday, February 25th, Troop 96 participated in Scout Sunday at The People’s Community Baptist Church in Silver Spring, Maryland. Several Scouts, Eagle Scouts from the Troop, and honored guests including Brian R. Frosh, Attorney General for the State of Maryland, showed reverence and celebrated the over 25-year relationship between Pack and Troop 96 during the Sunday service. General Frosh presented the Pastor, Dr. Haywood A. Robinson III, with a proclamation from the State of Maryland recognizing The People’s Community Baptist Church and Troop 96’s achievement of 50 Eagle Scouts. A history of excellence has defined Troop 96 as leaders in the White Oak District and the community. The Troop’s strong relationship with its host church has meant years of Scouting and opportunities for numerous Scouts to earn the rank of Eagle. Chartering Organization Representative Dana Myers helped receive the proclamation on behalf of Troop 96. Dana serves numerous roles in the Troop and as a volunteer with the White Oak District, including Nomination Chair. his talents in shot put to even higher levels of competition in the future. We will be watching his future with great interest. Jabari also serves as an Assistant Scoutmaster with the Troop, like other Troop 96 Eagles who’ve taken up leadership positions. Eagle Scouts serving in their Troop provide an invaluable service to the program. 5-8 Scouts as they respond verbally and demonstrate the skills necessary to treat 8 different scenarios such as burns, severe bleeding, shock, fractures, head injuries, cardiac arrest, allergic reactions and animal bites. The patrols are judged by a different judge for each scenario. The judges are volunteer State and local police, paramedics, doctors, and ER nurses. Troop 1011 Wolverines, Troop 270 Cyclops, 3rd place, Troop 1023 Thunderbirds, 2nd place Troop 274 Majestic Pheonix and 1st place Troop 470 Venom. When asked how the patrol prepared for the First Aid Meet, Assistant Scoutmaster Janice Gilsdorf replied, “The Scouts dedicated each troop meeting in February to practice first aid skills. One week we had a round robin type of event that included four stations- upper extremity treatment led by Robert Paugh; hurry cases led by Janice Gilsdorf; environmental injuries and scene safety led by Jim Vlassopoulos; and lastly, a First Aid jeopardy quiz led by Mark Murr. Additionally, the Scouts practiced using past scenarios; each Scout rotated as a Judge and had a chance to understand how they were being evaluated. It was interesting to see how generous or hard they were with their scores. Francis Scott Key District Welcomes New District Executive, Lauren S. Kefauver The National Capital Area Council and Francis Scott Key District are pleased to welcome Lauren S. Kefauver in the position of District Executive for FSK. Currently living in Frederick with her husband, a dog, and two cats, Kefauver grew up in Baltimore County and has called the region home for many years. Lauren discovered her passion for Scouting in a Venture Crew where she participated from ages 14-21, and cites these as some of her fondest memories. The highlight of those experiences occurred in 2010 when she took on and accomplished what she considers to be her greatest Venturing achievement: a trek through Philmont. While she hopes to return there one day, she is currently excited to have the honor and privilege to be working with the BSA on a professional level. Her plan is to make her way around and “cross paths” with all of the scouts and volunteers in the FSK District. Lauren is a graduate of Towson University and holds a degree in psychology. Greetings Goose Creek District Scouts and Scouters! Monkey fist, or the art of silk screening at crafts, delving into science projects or developing the skills to become proficient at the shooting sport, the Goose Creek Summer camps will have something for every child. The experienced staff will educate, demonstrate, guide and enable cubs in many areas of interest, creating fond memories they will cherish and wish to share with their own cubs once they are parents themselves. the sale. Also, registration for Goose Creek Day Camp, Twilight Camp, Camp Snyder and Goshen Scout Reservation is now open! Now is the time to start to plan for spring recruitment if you are planning on running a summer program within your pack or troop. If you can, send at least one of your leaders to Roundtable on the second Wednesday of every month to learn more about all the great opportunities going on in Goose Creek. Be sure to check in at http://ncacbsa.org/goosecreek for more information. See everyone on the trail! February, where he was a District Executive for the Delmarva Council. Mark is a native of the area, having grown up in Great Falls, VA before graduating from George Mason University. Mark is an avid lover of the wilderness and sports. He has a strong dedication to improving the community and encouraging youth development; having coached multiple youth sports, serving for developmental organizations such as the Presidential Classroom and at the YMCA of Delaware. As a former Cub Scout, he is honored to join the Boy Scouts of America and continue his dedication to strengthening the community. Please join us in welcoming Mark to the National Captial Area Council and Powhatan District. We wish him great success and much luck! Strong DC OA Chapter Representation at “Arrow Corps Puerto Rico” While many scouters in the District of Columbia were getting ready for spring break, six Order of the Arrow members from the DC Chapter of the Amangamek-Wipit Lodge, made their way to Puerto Rico from March 11 to March 17 to be part of the volunteer team of scouts and scouters from across the United States that made up “Arrow Corps Puerto Rico” as part of a service project to repair and enhance the BSA’s Camp Guajataka that was damaged during Hurricane Maria. campsites, as Hurricane Maria’s winds and rain were so strong that they wiped away a significant portion of the preexistent paint; repairing aspects of the camp’s electrical and plumbing systems; rebuilding part of a key bridge in the camp that had been damaged by the hurricane, with the bridge now known as the Friendship Bridge (Puente de la Amistad); remaking large ceremonial stone carvings in the camp’s primary campfire arena; and recreating trenches to allow for proper water drainage. Among all OA Lodges from the 50 states and the District of Columbia that participated, the DC Chapter had the highest number of volunteers from a single chapter. Three D.C. Arrowmen, Trevor Scofield, Jackson Frame, and Vicki Burns also ascended to the Brotherhood level during Arrow Corps Puerto Rico. Willis Thomas III “I liked how on the second evening being here we got to learn about how it was for the people here after hurricane Maria. It was both sad and inspiring to hear the different stories about how they had to endure what they felt after the hurricane and how they had to cope with the damage that was left behind. It gave me a new perspective on how lucky me and my family are not having to deal with something like that but also made me think how strong the people of Puerto Rico are being able to carry on and manage. My favorite work assignment so far was clearing away the bamboo camp. All of our work made the area even more beautiful than we found it. The camp wasn’t going to be able to use that campsite this coming summer so we were really happy we were able to get the site cleared. The council director immediately contacted scoutmasters in Puerto Rico to let them know that it was open. Arrow Corps Puerto Rico, together formed the largest contingent from any OA chapter among the 50 states and D.C. to have served as part of Arrow Corps Puerto Rico, and this forever shall be a testament to the strength and commitment of our chapter. Fellow Arrowmen of the Amangamek-Wipit Lodge of the OA, also served as part of Arrow Corps Puerto Rico were Michael Dragone, chief of the Mountain West Service Area; and Jim Hardter, Ceremonies Team Adviser for the Seneca Chapter. DC OA members that made this incredible trip of cheerful service included Howie Perlman, Chapter Adviser, Troop 524; Willis L. Thomas III, Chapter Chief, Troop 544; Jackson Frame, Troop 544; Vicki Burns, Troop 61; Trevor Scofield, Troop 380; and Tom Scofield, Troop 380. As a result of Arrow Corps Puerto Rico’s service, Camp Guajataka will be able to open for summer 2018 for thousands of youth to enjoy. The 100 Arrowmen from the 50 states and D.C. served alongside about 35 members of the Puerto Rico Council of the BSA (Concilio de Puerto Rico de los Boy Scouts of America), many of whom are part of the Yokahú Lodge (Logia Yokahú) of the OA, and about 15 Firefighters of Puerto Rico (Bomberos de Puerto Rico). “On the first day I was assigned to clearing brush but after the wood chipper arrived I was allowed to feed the wood chipper. I really liked that because it was my first time doing it. I was amazed how even big sticks could get destroyed in a few seconds. week, were we have 4 callers from the district making calls and raising money to get us back up in a better position than last year, which is about $10000 behind. With the various phone a thons taking place once a week and the constant attempts at getting more dates, we should be able to get about $20000 more out of the Scouter campaign, from what we did last year. We will need to get the units that have not given, which is about 20% of them to get the remaining $10000 to meet our goal. It will be a long challenge and this is going to take all year to complete, but with pushing and maintain a good relationship, we will meet the goal and set ourselves up for a better and smoother 2019. Troop 347’s Merit Badge College On March 3, 2018, 153 Scouts met in Dunkirk, MD to attend Troop 347’s annual Merit Badge College at Dunkirk Baptist Church. The Merit Badge College offered 17 different merit badges throughout its AM and PM sessions. The merit badges offered included Art, Automotive Maintenance, Aviation, Chemistry, Chess, Citizenship in the Community, Nation and World, Coin Collecting, Communication, Family Life, First Aid, Game Design, Genealogy, Leatherwork, Nuclear Science, and Public Speaking. If you would like to attend, be on the lookout for the first Saturday in March 2019. Special thanks to everyone who supported the day – counselors, helpers, and Scouts! Western Shore Day Camps Western Shore Day Camps at Kings Landing and St. Mary’s County Fairgrounds are coming along great. We have an incredible “Passport to (Science) Adventure” program planned with lots of STEM and outdoor activities for all Scouts. If you are interested in attending, make sure you register at www.gotodaycamp.org as soon as possible. If you have questions, feel free to contact the directors: St. Mary’s County Fairgrounds - 6/18 to 6/22 Email: cubscoutdaycamp.stmarys@gmail.com King’s Landing Park - 6/25 to 6/29 Email: ksheranko@gmail.com Day camps are conducted by adult volunteer leadership who were trained and certified at one of the Boy Scouts of America’s National Camping Schools. During the first weekend of March, Western Shore’s Camp/Program Directors attended National Camp School located at Camp Snyder, VA.
Upcoming Meetings TOA Chapter, Commissioner, and Roundtable meetings are every 2nd Wednesday at Patuxent Presbyterian Church, 23421 Kingston Creek Road, California, MD. 1. 630pm-730pm: OA Chapter Meeting 2. 630pm-730pm: Commissioner Meeting 3. 730pm-9pm: Roundtable District Committee Meetings are the last Wednesday (730pm-9pm) of the month at Lusby Southern Community Center, 20 Appeal Lane, Lusby, MD. Justin Barlow awards Scouts with camperships to assist in offsetting the cost to attend Day Camp. except that scouts supply the propulsion. Here in Virginia, snow is iffy so most patrols add removable wheels to help them traverse a three-mile course along marked trails and stream crossings. assess.” They said that “after Cripple Creek, we got lost by the cornfield” (they were soon found). Scoutmasters and Crew Advisors appreciate how Klondike Derby gets their patrols and crews to work together. One Scoutmaster commented that “the event was a lesson in planning and the importance of getting scouts motivated and committed to the plan. Additionally, it teaches them the importance of teamwork.” Another Scoutmaster said he liked the “skills practice and crew/patrol leadership opportunities.” Yet another Scoutmaster said he liked how the scouts were “on their own” which taught them “self-reliance.” A Patrol Leader confirmed, saying he thought preparing for and participating in Klondike got his patrol to bond together like never before. No wonder -- the Klondike Derby is designed from the ground up to implement BP’s Patrol Method. Following a great tradition, Chain Bridge District is already planning improvements, including a shorter course for younger scout patrols, for Klondike Derby 2019. Klondike Ho! year in February when Scouts thank their chartering organizations and share the experience of scouting with the members of these organizations. without the support of many of Colonial’s unit leaders and parents, and our units themselves. Special thanks to Colonial’s Explorer Post 2252, Chartered by the Franconia-Mt. Vernon Station of the Fairfax County Police and the Arrowmen of the Amangamek Wipit Lodge, Colonial Chapter for hiker support along the way. District News & Views George Mason District George Mason Pinewood Derby Races to Success The 2018 George Mason District Pinewood Derby Championship was a huge success. The fastest Scout entries in the district competed. Each Pack provided one Pack winner or representative per rank i.e. one Lion, one Tiger, one Wolf, one Bear, one Webelos, and one Arrow of Light Cub Scout to the District Pinewood Derby. Much thanks to all the volunteers and parents who made this event possible! HELPING OUR YOUTH OF TODAY FOR A BETTER TOMORROW! COME SEE OVER 20+ DIFFERENT VEHICLES AND ORGANIZATIONS FIRE TRUCKS, POLICE MOTORYCLES, POLICE HELICOPTER, MOBILE DMV AN MANY MORE! in my District’s Pinewood Derby and had so much fun seeing all of the Scouts having such a great time,” said Felton. “And I could never find people to go camping and hiking with me, but now I can do those things with my Scout family!” Ashley has long enjoyed working with youth, and in addition to still playing volleyball on a regular basis, she also coaches a team. She aims to bring these experiences to Scouting to further improve upon the great things that are already happening in Patriot District. “I’m enjoying everything I have learned so far, and continue to really enjoy helping young people,” said Felton. “My philosophy is that all things are possible if you believe.” Ashley is a graduate of LaSalle University and holds a Bachelors degree in marketing. in everything they do, the parents, Scouts and Scouters of Pack 845 realized just how “perfect” the theme fits Cub Scouting. The evening concluded with a presentation by the Pack’s own “Standing Bear” and the awarding of the Arrow of Light to 9 Scouts, along with a specially handcrafted and personalized Arrow and plaque. carnival and games night. TAO actually met Lord Baden-Powell (the founding father of Scouting in England) when Mr. Haas was a young Boy Scout in 1939, making him an actual generational bridge from the origins of Scouting in America to today’s Scouts! After spending some time observing and interacting with Cub Scouts at their games, Mr. Haas spoke to the Pack about some of his experiences, drawing a connection between the BSA and Pack 840 welcoming girls to the long history of Scouting’s role in breaking down barriers of race, religion, gender, and disability. The Scouts presented him with a “BSA Hero” plaque to thank him for his visit and for a lifetime of devoted service to Scouting. Pack 840 has always welcomed family participation at their events, so the switch to being a Family Pack was seamless. The Pack’s first registered girls were all siblings, cousins, and friends of current Scouts and their families. Den 7’s girls are all very motivated to pursue their rank badges. Families are enjoying having full access to the Cub Scouting program for all their children. f you have questions or would like more information about our experiences with Family Scouting in Cub Scout Pack 840, visit their website at stafford840.mytroop.us/ node/5233 or their public Facebook page @ cubscoutpack840. to make her comfortable while CJ and Andrew got blankets, pillows, snacks and water. In the thirty minutes or so that it took for EMS to arrive the Scouts and adults talked to Ms. Nancy about fishing, scouting, and other topics. After first responders arrived the Scouts assisted paramedics with back boarding her and clearing the (From Left) Bob Brandt, Andrew S, Jordan B, CJ way for the 80 yards walk to Petrillo,and Chris Petrillo the ambulance. temperature was 92 degrees when she was Ms. Nancy, a 72 year old woman, had gotten admitted to the hospital. Had no one been lost while driving earlier in the day. She had scheduled to camp that weekend it is very likely driven onto Camp and her car ran out of gas that Ms. Nancy would have died from exposure. in the area of the Chapel. When the Scouts found her, about 800 yards from her car, it was Congratulations Scouts. You were brave in apparent she had been lying in the rocks for the face of uncertainty, helpful to a person in several hours. need, courteous, kind, and cheerful dealing The Scouts received word the next day that with a unique and unexpected event. You were Ms. Nancy’s had been hypothermic; her body prepared, and you did a great job! opportunity to learn about family scouting and were disheartened to find that none were available in their area. Thankfully, through a discussion with another volunteer they were asked “why don’t you make your own Family Scouting unit?” That’s it! It was that simple! With zeal and a passionate drive, Brent and other families began to “make it happen”! It is no longer a dream for Presley and other young girls to earn the rank of Eagle. It is because of active and determined dads like Brent, that younger girls in his community will now be allowed to join the Cub Scouts and older ones could earn the rank of Eagle Scout in Mattaponi. “We are more than excited to participate in this revolutionary and historic time for the Mattaponi District, it is more than allowing girls into the program. It has always been about the family. Mattaponi stands behind its family scouting promise, to ensure, that all girls have the opportunity to join” District Executive Jasmine Pletzer said at the Mattaponi roundtable. See you at Day Camp Presley! Your “Passport to Adventure” Awaits at Occoquan Day Camp! at Leesylvania State Park, our beautiful state park that sits on the Potomac River. than any other volunteer group in a single service project for the Park. The Troop then enjoyed a movie and tour at the Park Visitors center after completing their service work. lives he had influenced through Scouting. I could only imagine the long line of young people with whom he had camped and hiked and taught outdoor skills and life skills to. I’m sure he remembered them all, one by one. I took my cell phone and asked him for his permission to take his picture and share the experience. He joyously agreed and shared with me that his name is Edwin B (Barney) Lawless, former Scoutmaster, currently Committee Chair of Troop 1347 here in the National Capital region. He has been a volunteer in Scouting for over 50 years and is still deeply involved in Scouting. He is 84 years old. He and I swapped stories of boys, leaders, experiences and great moments we have both had in Scouting over the years. As we parted I thanked him for all the generations of boys he has influenced through Scouting over the years. He teared up as he said to me “Don’t ever think a Scoutmaster isn’t paid.” “Right you are,” I replied. “Right you are”. The pay volunteers and professionals get in investing their time and our energy and their “gifts” in working with Scouts is much more valuable than the green stuff we call cash. It is the privilege of knowing how many young lives are touched and how Scouting makes a difference. Are you making a difference today? No matter what level you are involved and no matter what role in Scouting you assume as an adult leader, I’m sure you are. Are you being paid in the knowledge that you are making a difference in the lives of young people today? I’m sure you are. How much is your time and presence in Scouting worth to you? It’s the same as to the old Scoutmaster answered to me, “Don’t ever think a Scout leader isn’t paid”. Your time and presence are invaluable, and your rewards are priceless! There are always new generations of boys and girls to be touched with the values and goals of Scouting. Thank you for your service to the young people of America! Monthly Pack Meeting While working on his Journalism Merit Badge, Nick of Troop 1887 made a few observations from his perspective as a new Den Chief for Pack 1513. In the process, he made a few new discoveries of his own and gained a greater appreciation for the orderliness--and relative peace--of that come after you’ve crossed that bridge to receive the Arrow of Light. Thanks for the insight, Nick, and good luck in your duties as Den Chief. The volume in Fairfax Villa Elementary School was deafening as I started my first night as a den chief in Cub Scout Pack 1513. Tigers and Wolves scooted past playing tag, climbed on folded tables, and screamed mindlessly. I thought: my friend Alex was right, I had sold my soul to the devil. But it was part of my new job to attend den meetings and these monthly Pack meetings. awards ceremony. After the skits, awards were given to virtually all youth members of the Pack for various achievements, such as Duty To God for the Arrow of Lights, and Tiger Bites for the Tigers. Cubmaster Tim Hammerquist asked for volunteers for various fundraisers like Camp Cards and he also announced the Spring campout at Pohick Bay. The Pack also welcomed a newcomer, Bear Sebastian Mendez, who was initiated as a Bobcat, and me in my new role as den chief. For a group that has so many 6-, 7-, and 8-year-olds, I would say that it was well organized, however a massive change from the order at Boy Scouts meetings I am used to. But at least the chaos had its purpose. The reason for allowing all that noise was to drain all the youthful energy from the youngest of the pack in order to keep them quiet during the real meeting. To finish off the meeting, the soon-to-be Boy Scout Arrow of Light Den also performed a ‘song’ on homemade instruments as part off their requirements for the Maestro award. Quaker Oats cans, kazoos made from tongue depressors and maracas made from water bottles filled with dry pasta all came together in a symphony of ridiculous sound. Once again, noise filled the air, and I was reminded how much I appreciate the quiet orderliness of my Boy Scout meetings. Troop 7227 collected 2000 Lbs. of food items and $638.00 in cash at their Scouting for Food event before a week before Thanksgiving. The scouts made a presentation to Pastor Ed Cullen and his wife Debbie of the Southgate Baptist Church for their Lighthouse Mission. The mission which is located in the town of Christiansted serves meals daily to the homeless around the town. The troop also donated Christmas gifts for the Toys for tots program. Aidan “Daniel” M. of Pack 7131 has continued his winning ways. Eight year old Daniel and his brother were featured in the winter 2017 edition of SD when they won the Governor’s Summer Reading Challenge in their age categories on St. Croix. Daniel has taken it a step further and has now won first place in the 2017 Boys’ Life “Say Yes to Reading!” Contest. For more information about Direct Service Scouting, please visit NCACBSA.org/DirectService or contact Field Director Peggy Durbin. Dates subject to change. Check the website for updates: www.NCACBSA.org/Calendar. by Roger Claff PACK ADVANCEMENT CEREMONY TONIGHT! PACK ADVANCEMENT CEREMONY TONIGHT! I‛M SURE GLAD THAT‛S OVER! BECAUSE I JUST CAN”T “BEAR” IT ANYMORE! WHEN YOU CALL BEFORE 07/01/2018* Personalized Attention. Proven Results. Â©2016 Huntington Mark, LLC. Independently Owned and Operated. SAT and Advanced Placement (AP) are registered trademarks of the College Board. PSAT/NMSQT is a registered trademark of the College Board and the National Merit Scholarship Corporation. ACT is a registered trademark of ACT, Inc. None of these entities was involved in the production of, and does not endorse, this program. *Offer valid for Academic Evaluation, HLC3105 new students only. Not valid with any other offer. Family Scouting, Youth Protection Training 2.0, Hooked on Scouting, Day Camp and more as NCAC gets ready for summer!